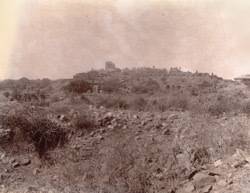 Photograph of Fatehpur Sikri from a distance, taken by Edmund William Smith in 1893, from the Archaeological Survey of India Collections. Fatehpur Sikri was built the Mughal Emperor Akbar (r.1556-1605) between 1571 and 1585. The city was founded here to celebrate Shaikh Salim Chisti's prophesy of the birth of Akbar's son and heir, Prince Salim, later Emperor Jahangir. The entire city was quarried from local red sandstone, known as Sikri sandstone. Akbar only resided in the city for fifteen years before moving his imperial capital to Lahore and then back to Agra, where he has begun his reign.